And now, a word about the brown marmorated stink bug. If you haven’t heard of it, count yourself lucky. This autumn the stink bug, or Halyomorpha halys, has rocketed to the top of the most-hated invasive list. The stink bug is an insect that makes the skin of even the most bug tolerant crawl. Here in the Northeast, this fall’s quasi-biblical invasion is in full swing. And we’re not alone. This noxious Asian native has migrated across the continent, and farmers, homeowners, and agricultural researchers are desperately searching for effective measures to eliminate this wily enemy. Who and what is this prehistoric-appearing nemesis that spreads fear and loathing wherever it’s found? 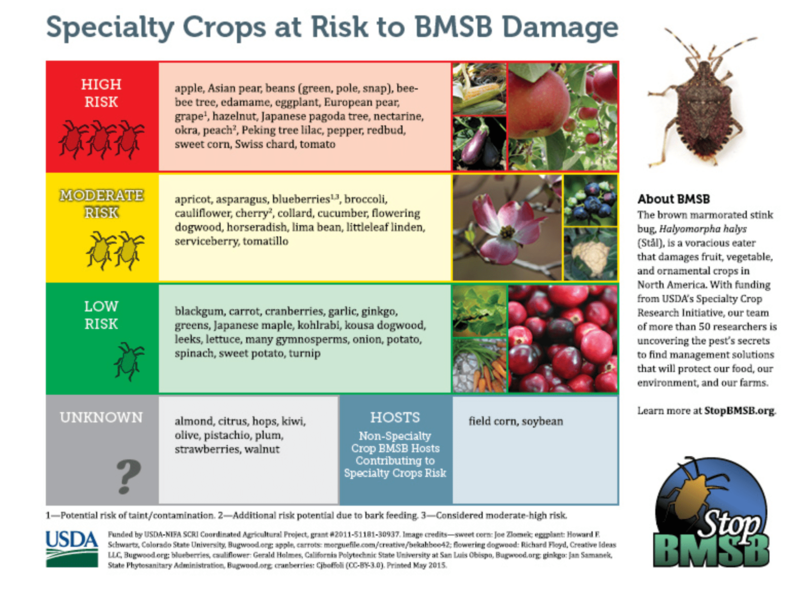 Out in the fields, stink bugs are causing millions of dollars of damage to a variety of crops. In homes, the stink bug clings to sun-drenched exterior walls and speckles the insides and outsides of window screens. Seeking shelter to hibernate for winter, the bug finds its way indoors through the tiniest of cracks. It clings to window shades. It hides in air-conditioning filters. It snuggles down in the folds of pillowcases, window blinds, and blankets. It drops from the ceiling onto unsuspecting sleepers, awakening them to paroxysms of fight-or-flight. Capture or squash them at the risk of having their stomach-churning coriander-like odor pervading fingers or rooms for days. And their sound in flight—a spine-chilling, buzz-saw sound that far outstrips what one might expect for their one-half-inch-size—is the stuff of insectophobes’ worst nightmares. Is there a lesson in the destructive tale of the stink bug? Of course there is, and it’s important that we connect the dots and acknowledge the larger picture. Without much irony, you might declare that “stink bugs are us.” That’s because the bug’s presence here in the U.S. is just one of many examples of the negative environmental impacts of a global market fed by our voracious appetite for low-cost consumer goods. In other words, the stink bug established a beachhead in our homes and on our farms as a direct result of our preference for low-cost t-shirts, pants, shoes, and small appliances produced in factories located in low-wage markets far from these shores. American continent? Researchers believe that the bugs made their first inroads in Pennsylvania, where the first sightings occurred in Allentown in 1998. Speculation is that the stink bug stowed away in wooden shipping crates transporting either manufactured or agricultural goods from Asia. Over the next two decades, their territory spread to twenty-eight states. Today the number of states in which they’ve found a cozy haven stands at forty-one. Regardless of its humorous-sounding name, the stink bug is no joke. For home owners, the stink bug is a seasonal nuisance, but for farmers the impact is far more serious. Just how dire is the stink-bug threat to agricultural production? Unfortunately, the average stink bug isn’t a fussy eater, feeding on both fruit and vegetable crops. The stink bug consumes peaches, apples, cherries, grapes, pears, tomatoes, peppers, corn, soybeans, and green beans, and more. producers in the Northwest. Stink bugs feed on the grapevines and then hitch a ride on the harvested grapes as they make their way through the wine-making process. During the process, the stink bug’s musty stink, or in more scientific terms, the stress compound identified as (E)-2-decenal, fouls the aroma of the fermented grapes. And unless wine drinkers’ olfactory expectations change dramatically, the dire economic consequences to the wine industry are obvious. The stink bug problem is, in fact, so dire that the USDA’s Specialty Crop Research Initiative now has fifty researchers rushing to look into ways to combat this stinky destructor. Right now those researchers believe that weaponizing another Asian invasive pest, the tiny, parasitoid Trissolcus japonicus—or, as they are more affectionately known, the samurai wasp—will help control and decrease the population of stink bugs. How does the samurai wasp accomplish biologically what other measures do not? In one of the cruelties of nature, the samurai wasp lays its eggs inside the eggs of the brown marmorated stink bug, thereby destroying the stink bug’s brood. Doing even a cursory search online about stick bugs reveals that researchers and agricultural agencies are so alarmed about the stink bug problem that the bug has the distinction of having has its own website dedicated to educating the public and reporting on advancements in management strategies. (www.stopbmsb) The stink bug also has its own online early-detection and distribution mapping system, hosted by the Center for Invasive Species and Ecosystem Health, that encourages the public to report stink bug sitings. Next Post:US has troops in Niger? Why?